This year we are back at the Techno Classica in Essen. Your carburetter better than new? General restoration includes chemical and mechanical cleaning, exchange of all wearing parts, bright plating of ferrous parts, professional assembly and a final, thorough control of all parts. After final specialist fitting, you will have a better carburetter than as it left the assembly-line. Carburetters will normally be offered in exchange, when on stock. Can you do mine too? 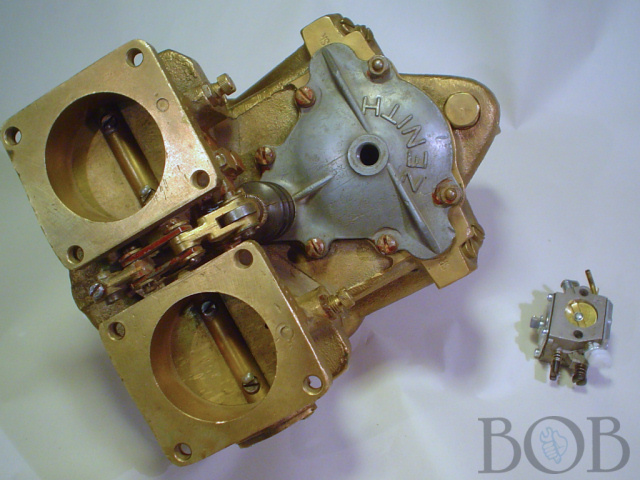 It´s possible to restore nearly all types of carburetter, but I specialise in SU, Solex, Stromberg, Zenith and Carter up to about 1975 and air valve bodies. I don`t touch Weber (see www.vgsmotorsport.de) or japanese Carburetters (except 240 and 260 Z) and do not sell small spares. To be on the safe side, please check the archive or the pricelist. Left: Zenith 56 DC, Centurion tank, 28l. V-12 Motor, 820PS, weight 12,9kg. Right: Walbro, Chainsaw, 42ccm, 1,3PS, weight 0,125kg..
Why don`t you stop and say hallo if you see me at my stand at one of the big exhibitions or auto-jumbles? You can see where I am next by checking the feature file. Have a look in my tiny workshop - live. 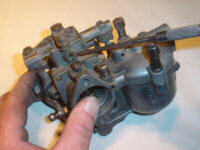 It is also possible to give you hints and help with a similar carb out of my stock. Visit my Workshopcam. Several specialist magazines (german speaking-area) have printed articles about my work, including technical tips. Of course it`s possible to download these, but they are only available in german language. Still a bit unsure? Then take a look in my reference-file. Not only private-drivers, but also marque-clubs, racing-firms and manufacturers entrust their work in my hands. I`m an Englishman and have lived for many years in Hamelin, specialising in the restoration of carburetters. If you want to know a bit more about me, click onto my personal-file.